Hello everyone, I hope you’ve had a fab week! See that floor? It was dreadful, greasy lino tiles stuck on more horrible lino. 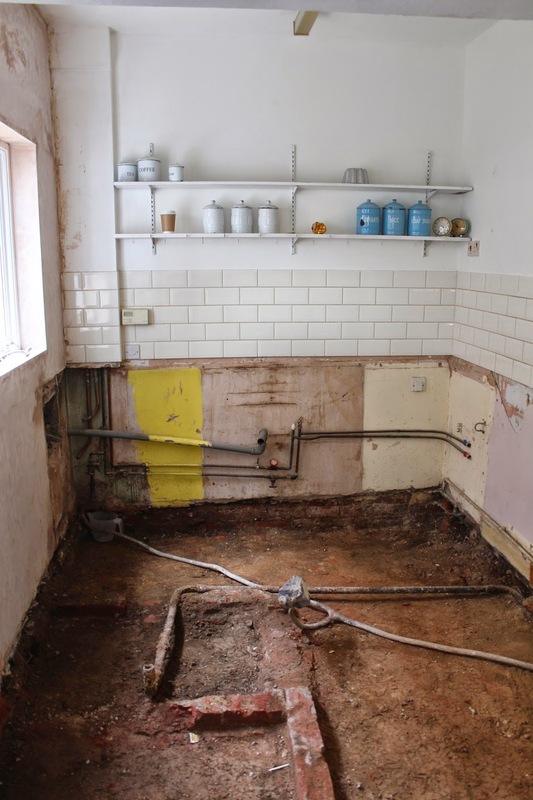 There was a door to the left which I knew as soon as I looked round the house that I needed to replace with a window, to make more usable worktop space. 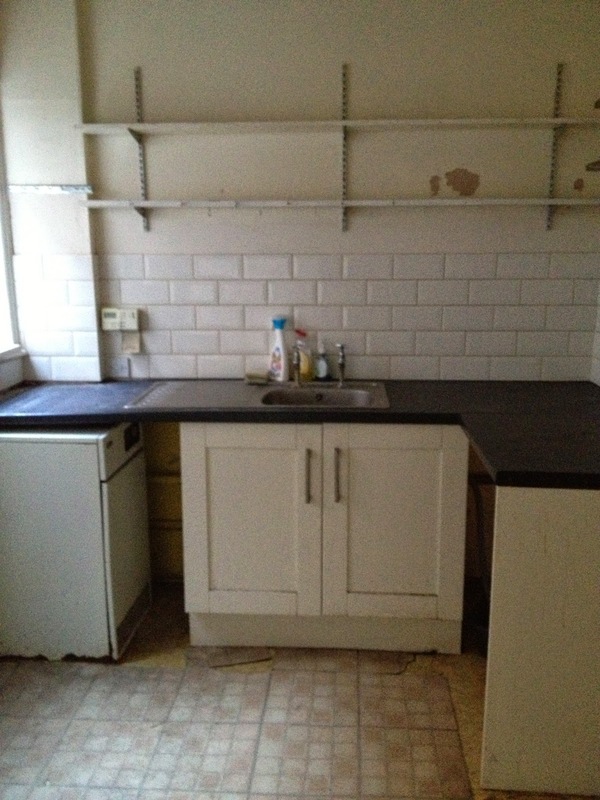 The boiler in the corner was on it’s last legs, there was strip lighting and the shelving was filthy. I had my work cut out! The only thing I wanted to keep were the subway tiles, and there was no guarantee I was going to be able to save them. However it was so very worth it, as I love my new floor and the kitchen flows beautifully into the dining room. The next stage was installing the worktops, for which my dad came up and worked his DIY magic. I found my beautiful beech work top here, at the bargaintastic price of £210 for 6 meters of prime beech worktop, which my dad cut with a jigsaw to fit my butler sink in. 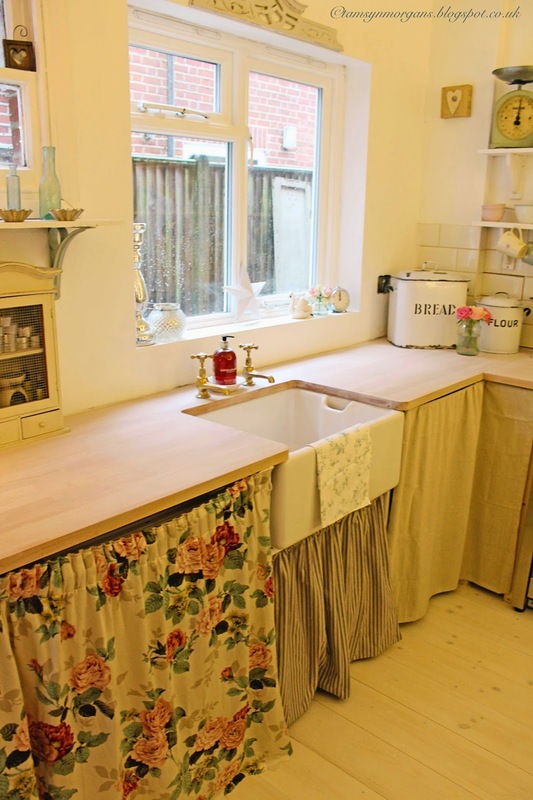 My sink is a second hand reproduction one which I got for £50 from a dear friend – we actually salvaged it from her garden! Until I get cupboard doors made from old pallets, I’m making under counter curtains from an old French linen sheet – I will share pics with you as soon as I have made them! The electrician took my tiles off very cleanly to put my plug sockets in, so after a good soak in a bucket of water, I was able to clean the glue off the back, so I can put them back up. I even reused the shelving, after taking the nasty metal wall brackets down and replacing with cheap and cheerful wooden brackets from B&Q. 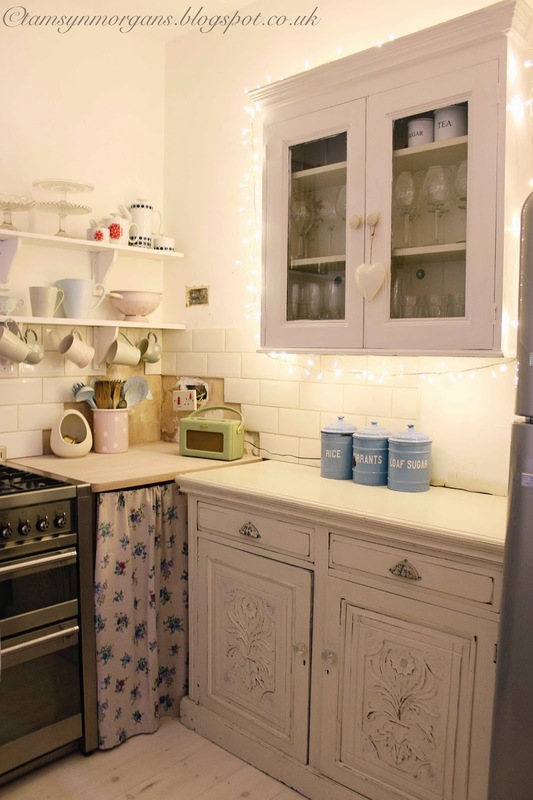 The freestanding sideboard and wall cupboard were from an auction, my beloved Smeg cooker came with me from the old house and my dad got the brass taps from a car boot fair. 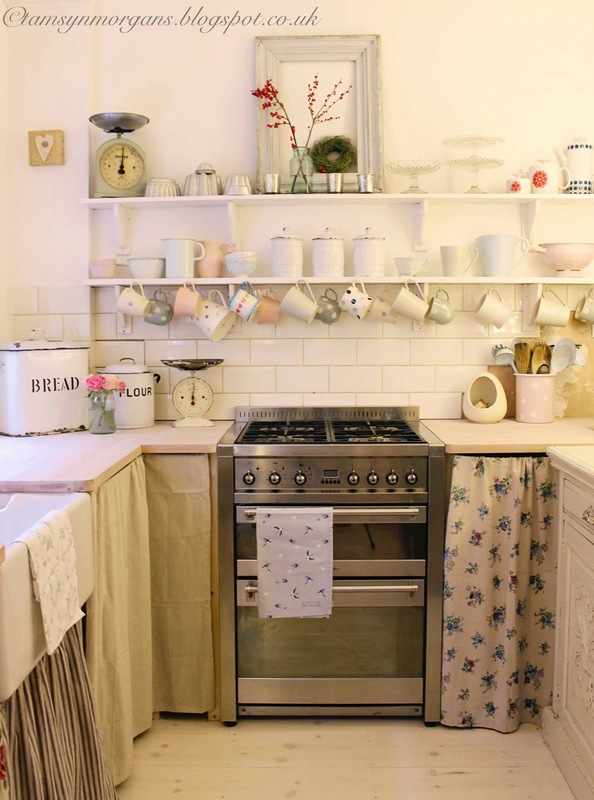 I love that fact that the kitchen has been made on a budget, and using as many second hand and reclaimed items as possible – it gives it a warmth and patina which is much harder to achieve with brand new fitted kitchens. I will share more detailed snaps with you over the coming weeks, including my upcycled chandelier which my electrician is hanging for me this week! It looks amazing- So cosy and cute! 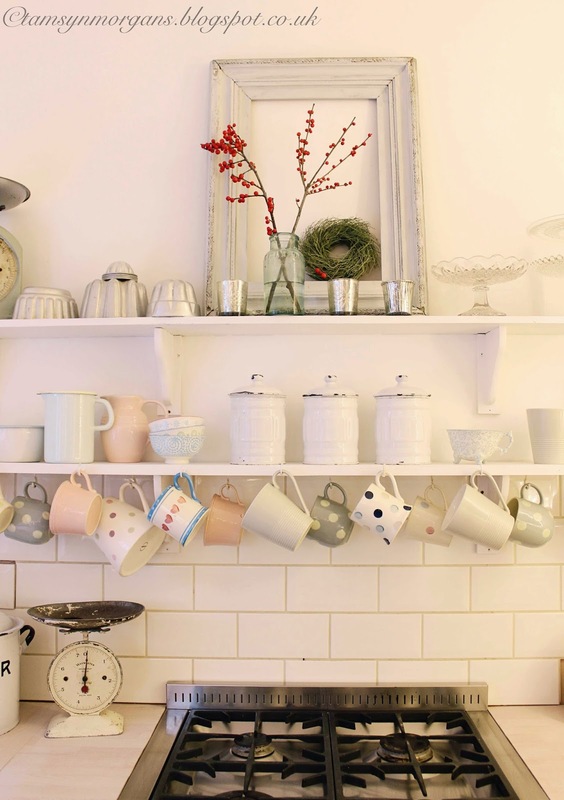 I love that all your cups are hanging on display, and I love the little curtains around the cupboards, the whole thing is just perfect! Kitchen envy!! I absolutely love it! Every bit! Charming and perfect! 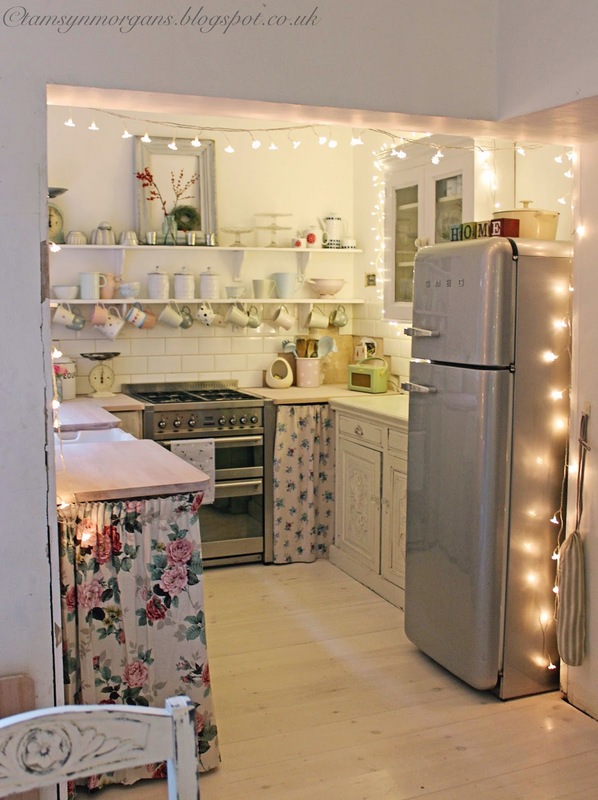 How did you connect the little lights going around the ceiling and down the side of the fridge? Wow your kitchen is so amazing and simple . I like that it is unique and made from recycled and repurposed materials.ed. You have inspired me to start my kitchen project. I canticipate wait to see your complete project.